If you had thirty seconds left to live, who would you call? The bank, or the person you loved most? What an important question. Almost everyone would arguable say that they would call home to their parents, husband or wife, or maybe even to their grandparents. Next question: Who do you invite over for dinner? Did you know that JFK’s father invited highly educated, affluent people over for dinner on a weekly basis? In doing so, John would sit at the table and study these guests as a boy, taking attributes about each of them and applying them to his own life. 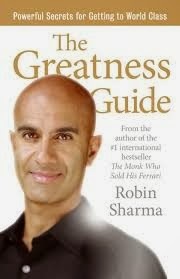 Robin Sharma, a Canadian born leader, writer and teacher recently wrote an amazingly practical book titled, “The Greatness Guide”. His guide is filled with historical leaders, personal experiences and teachable moments all written in a concise way which promotes reflective excavation. Simply put, he writes a mindfully brilliant book. There are leaders, then there are those who lead; Sharma leads. A leader is someone who can be the first driver in a line of cars at a stop light. They lead the procession through the intersection when the light turns green, but they don’t actually lead. Someone who leads is someone who practices what they preach, is the same person you see in a variety of public settings and who stands for something greater than themselves. A classic example is Martin Luther King Jr. People traveled from all across the U.S to hear him say, “I have a dream,” not “I have a goal,” and he was the perfect example of a leader who leads. Aside from the importance of leadership, Sharma also writes about something that I have been able to apply to my own life. He informs us that in order to accumulate a variety of wealth, we must first organize and 'de-clutter' our lives. Emotional, mental, social, intellectual and physical wellness cannot be achieved if you have “clutter” setting you back. Lately, I have mindfully practiced 'de-cluttering' my life and it has been astonishing. I think more clearly, I am more efficient with my job and I am more focused on my goals. Which leads me to another important part of Sharma’s Guide: focus. If you really, really, really want to succeed in life by accumulating inner, physical, social, career, economic and impact wealth, you have to focus. Focus each hour of each day in bringing your best foot forward. Focus on tasks rather than time, focus fully on one project and pay attention to the small details of your life. Now, you are probably thinking, “Ryan, I am not quite sure if I know what you mean.” Think about it like this: when you are watching game seven of the World Series and the bases are loaded, whether you are in the stadium or watching the game from home, when the hitter drills the ball to deep center field, what do you watch? No fan watches the runner on first, second or third. They are watching the ball as if they want to help it go over the wall. Can you imagine if all of that focus was applied to your professional and personal life each and everyday, in every decision you make? Do yourself an emotional, intellectual and mental favour. Buy Robin Sharma’s book. Scribble notes through it from front to back. Feel free to keep this conversation going on twitter @wellnessrf. Outside my office is a beautiful trail called “The Greenway”. It stretches for miles, is wide enough for bikers, joggers and walkers together. 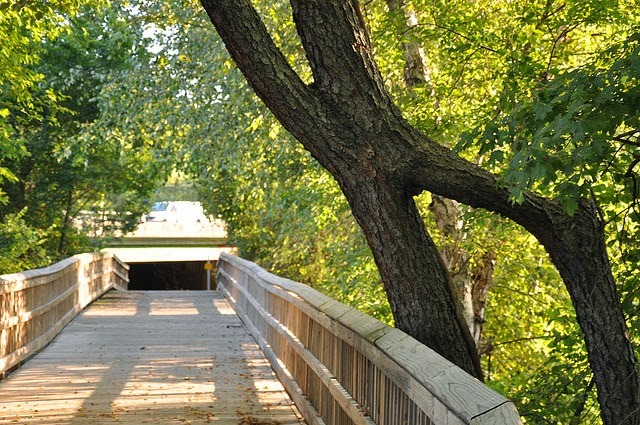 It combines a great taste of both nature and city infrastructure. The other evening after work I decided to take a walk along the Greenway to just think. I was walking along and thinking about some big life questions when suddenly a man appeared out of the woods about 200 feet in front of me. Now, being the realist I am, I quickly studied the man as he appeared to be wandering more than walking. He stopped to look at the creek beside the trail, turned and stared at me and then continued his seemingly lost approach down the Greenway. I quickly sensed that if this man were to speak to me, it would be with wrong intention. Even so, I continued to walk back to my destination. The man looked at me as I approached and said, “Excuse me sir, do you walk here often?” I looked back him and sternly said, “No, never.” and I briskly walked away. The point of this event is that we live in a safety obsessed society because of people like that…Was his intent legitimate or were his motives undermining me being naive if I had answered the question? Either way, I walked away and took my EQ with me. See, we all know that sketchy people hangout in freely accessible outdoor environments because they can get away with it and it is their right to do as they please. But the real issue here is this: Would I walk that same route at the same time again and expect a different result? Probably not. If so, it would be classified as ‘insane’. Either way people like that easily mislead innocent individuals by scaring them away from free outdoor physical activity opportunities. We need more people holding signs saying, “I hope you are having a great walk and enjoying this God given beautiful day”. Maybe that would make things seem safer? Ultimately, taking risks will run you into some form of adversity. Being mindful of your adverse situation is always the best practice, but do not let it deter you from walking a different route or from exercising entirely. The world needs good people who are out running and walking to model physical activity and make a difference in improving the health of our society. When I am wondering how good my workout is going to be I simply watch this video and realize that even if my workout is bad; at least I rose to the occasion of scheduling it in during a busy workday. It is sometimes the smallest of things that we forget to highlight. Thank you, Bryce Harper!